Justin T. Rogers (continued from page 36) of 47.8 feet, and a depth of 12 feet. Operating draft is just over 9 feet. Midland's decision to build heavy-fuel boats was based purely on economics. The price and avail- ability of fuels are two major fac- tors in moving cargo competi- tively. Midland operates the Rogers on the lower Mississippi River be- tween Cairo, 111., and New Orle- ans. The new vessel is used to transport coal, grain, and other dry bulk commodities. The 2,200-dwt vessels have an overall length of 288.7 feet, beam of 57.4 feet, depth of 32.8 feet, and operating draft of 26.25 feet. They carry crews of 18 persons and are designed for optimum performance in both open and ice-covered wa- ters. 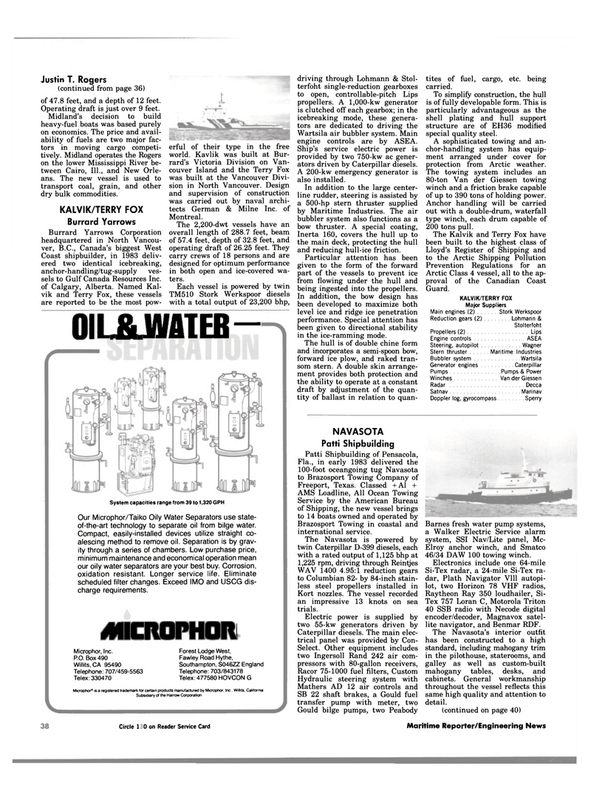 Our Microphor/Taiko Oily Water Separators use state- of-the-art technology to separate oil from bilge water. Compact, easily-installed devices utilize straight co- alescing method to remove oil. Separation is by grav- ity through a series of chambers. Low purchase price, minimum maintenance and economical operation mean our oily water separators are your best buy. Corrosion, oxidation resistant. Longer service life. Eliminate scheduled filter changes. Exceed IMO and USCG dis- charge requirements. Wartsila air bubbler system. Main engine controls are by ASEA. Ship's service electric power is provided by two 750-kw ac gener- ators driven by Caterpillar diesels. A 200-kw emergency generator is also installed. Inerta 160, covers the hull up to the main deck, protecting the hull and reducing hull-ice friction. Particular attention has been given to the form of the forward part of the vessels to prevent ice from flowing under the hull and being ingested into the propellers. In addition, the bow design has been developed to maximize both level ice and ridge ice penetration performance. Special attention has been given to directional stability in the ice-ramming mode. The hull is of double chine form and incorporates a semi-spoon bow, forward ice plow, and raked tran- som stern. A double skin arrange- ment provides both protection and the ability to operate at a constant draft by adjustment of the quan- tity of ballast in relation to quan- tites of fuel, cargo, etc. being carried. A sophisticated towing and an- chor-handling system has equip- ment arranged under cover for protection from Arctic weather. The towing system includes an 80-ton Van der Giessen towing winch and a friction brake capable of up to 390 tons of holding power. Anchor handling will be carried out with a double-drum, waterfall type winch, each drum capable of 200 tons pull. Brazosport Towing in coastal and international service. Kort nozzles. The vessel recorded an impressive 13 knots on sea trials. Elroy anchor winch, and Smatco 46/34 DAW 100 towing winch. Tex 757 Loran C, Motorola Triton 40 SSB radio with Necode digital encoder/decoder, Magnavox satel- lite navigator, and Benmar RDF.